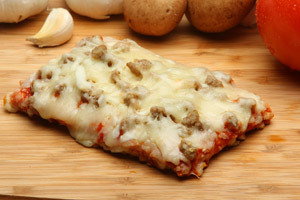 088838 – One 4.95oz 4×6 Sausage Cheese/Cheese Substitute Pizza with Soy and Whole Wheat Crust Provides 2.00oz Equivalent Meat/Meat Alternate, 2.00oz. Equivalent Grains and 1/8 Cup Red/Orange Vegetable for the Child Nutrition Meal Pattern Requirements. CRUST: Water, Whole Wheat Flour, Enriched Flour (Malted Barley Flour, Niacin, Reduced Iron, Thiamine Mononitrate, Riboflavin, Folic Acid), Vital Wheat Gluten, Defatted Soy Flour, Soy Protein Isolate, Soybean Oil, Sugar, Yeast, Salt. CHEESE: Low Moisture-Part Skim Mozzarella Cheese (Cultured Pasteurized Part Skim Milk, Salt, Enzymes), Mozzarella Cheese Substitute (Water, Casein, Partially Hydrogenated Soybean Oil, Salt, Sodium Phosphate, Modified Food Starch, Lactic Acid, Sorbic Acid (preservative), Sodium Citrate, Guar Gum, Artificial Flavor, Artificial Color, Vitamin and Mineral Preblend (Magnesium Oxide, Zinc Oxide, Ferric Orthophosphate, Riboflavin, Folic Acid, Pyridoxine HCL, Niacinamide, Thiamine Mononitrate, Cyanocobalamin, Vitamin A Palmitate)). SAUCE: Tomatoes (Water, Tomato Paste [Not Less Than 31% Soluble Solids]), Contains 1% or Less of: Onion, Salt, Spices, Garlic Powder, Soybean Oil, Xanthan Gum. SAUSAGE: Ground Pork (No More Than 30% Fat), Water, Spices, Salt, Dextrose, Garlic Powder.